Though Kurt Angle had a solid run as the Monday Night Raw General Manager, his in-ring record since coming back to the WWE is shoddy at best. With WWE's latest announcement on Twitter, maybe his loss to Baron Corbin this week was the straw that broke the camel's back. Kurt Angle has been involved in ten matches since coming back to the WWE. However, only a handful of them haven't been multi-man matches. Angle's in-ring return to the WWE was successful, replacing Roman Reigns as a member of the Shield in a 3-on-5 handicap TLC match. Following that, he was part of the winning team at Survivor Series 2017. At WrestleMania 34, he teamed with Ronda Rousey in her debut to defeat Triple H and Stephanie McMahon. Angle's next two appearances were in battle royal matches, first losing the Greatest Royal Rumble, then winning a battle royal to win a slot in the Best in the World Tournament at WWE Crown Jewel. However, this was when his luck would turn sour. At Crown Jewel, he was beaten by Dolph Ziggler. A few days later on Raw, he was forced to submit to his own submission move, the ankle lock, being embarrassed in the process by Drew McIntyre. 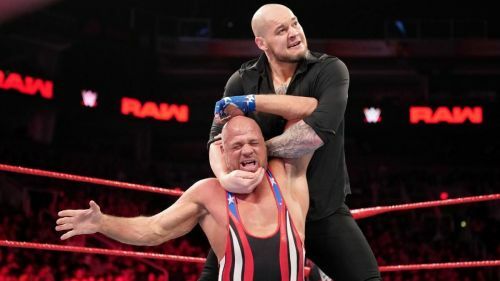 Though he did pick up a victory on the December 17th episode of Raw when Baron Corbin was mercilessly beaten by Apollo Crews, Bobby Roode, Chad Gable, and himself, Corbin would get his revenge on the WWE Hall of Famer this week. To follow up a quick elimination at the Royal Rumble with a loss to the man who replaced him as the Raw GM may have been too much for Angle to bear. On their Instagram, WWE revealed that the former WWE Champion would be making a huge announcement on Monday Night Raw. The former General Manager will be revealing his future in the company to the WWE Universe. With a 0-3 singles record since his return, will he be announcing his in-ring retirement? Kurt Angle could possibly be setting up his WrestleMania feud. After all, we are on the road, and it's possible the Olympic Gold Medalist is looking to get revenge against either Baron Corbin or Drew McIntyre. With all the news and rumors regarding multiple superstars leaving the company, it's possible the WWE will use that to further his story as we move forward. However, it may be possible that Angle will announce his retirement from in-ring competition. At this point, it's all speculation, and we'll have to wait until Monday Night Raw to find out.